One-bedroom with expansive ocean views and King bed, located right on the edge of town. This 2nd floor condo features expansive ocean views and spectacular sunsets all year round. The open floor plan has A/C throughout, reliable 60 Mbps Wi-Fi, and six major appliances. The spacious bedroom features an Eastern King size bed with a Simmons Beautyrest Black mattress and 650 thread-count sateen soft 100% cotton bedding. Bedside USB ports, reading lamps, and a book library are at arm’s length. 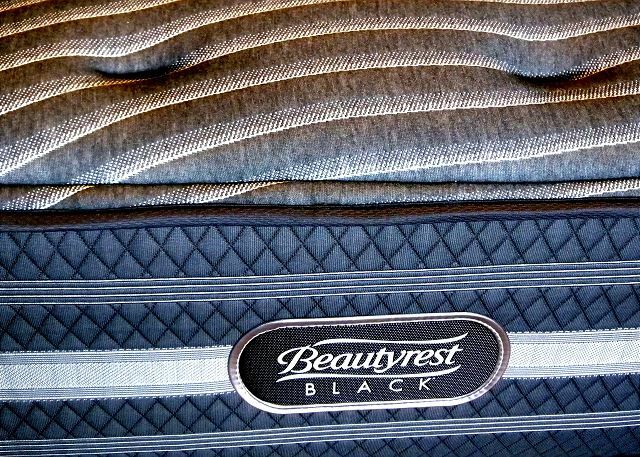 A black-out bamboo curtain/liner ensures that you can sleep in darkness, even when the sun is high in the sky. Complete with A/C, a ceiling fan, and large windows, the air flow is always in your control. The bathroom is accessed directly from the bedroom, but can also be accessed from the living room for guests who sleep either on the queen sofa bed or twin air bed. The condo comes with all the amenities you need for daily living. The well-stocked kitchen provides gas stove, coffee brew, press, and Keurig coffeemakers, bean grinder, Italian Ballarini oven-safe cookware, spices and savory condiments, bakeware and baking staples. The outdoor recreation equipment is available to you – boogie boards, snorkeling gear, water shoes, beach chairs and mats, coolers with dishes, a large shade umbrella, yoga mats, and a sizeable carrying tote. After a full day outdoors, relax with cable TV/DVD player, a 50+ DVD library, board games, or good book. 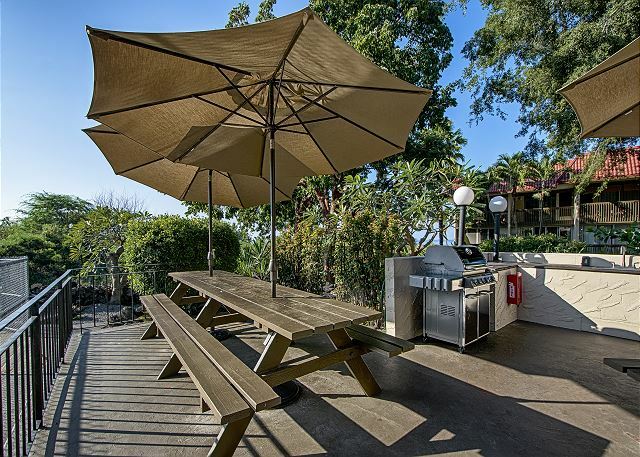 Outdoors at the Kona Mansions complex is a saltwater swimming pool, large gas BBQ area, and picnic tables. Your dedicated parking spot is right outside the building for easy above-ground access. The condo is just steps away from the nearest beach, where you can drop in for the beachfront yoga class, or take your lunch to the beach picnic tables, or even join the boogie-boarders. A few minutes’ walk in the other direction takes you right into town. Kailua-Kona has a small-town seaside resort atmosphere, with many restaurants, lively pubs, gift shops, open air markets, convenience stores, historical sites and swimming beaches within walking distance of the condo. A short drive/bus ride provides access to larger grocery stores, shopping malls, golf courses, snorkeling beaches and the local movie theatre. Paved highways make day-trips easy to all parts of the Big Island, including Volcano National Park and the new mid-island direct route to Hilo. 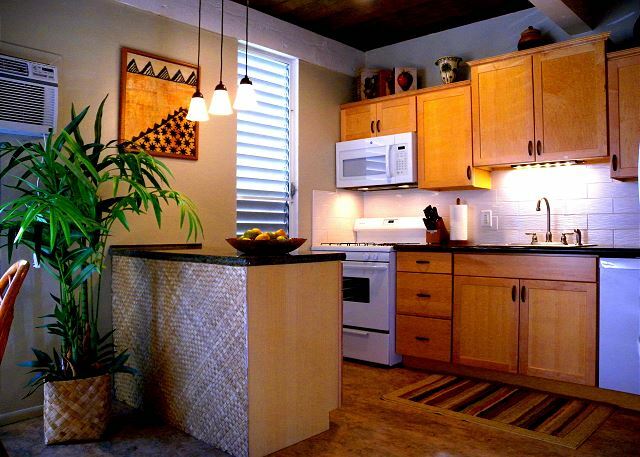 This condo is the perfect ‘home base’ for your Hawaii getaway! The Condo was equipped with everything anyone could ever need to make their stay very enjoyable. Pots, pans, dishes, coffee grinder,beach chairs, boogie boards, beach towels, spotting scope, and I could go on. It was excellent! 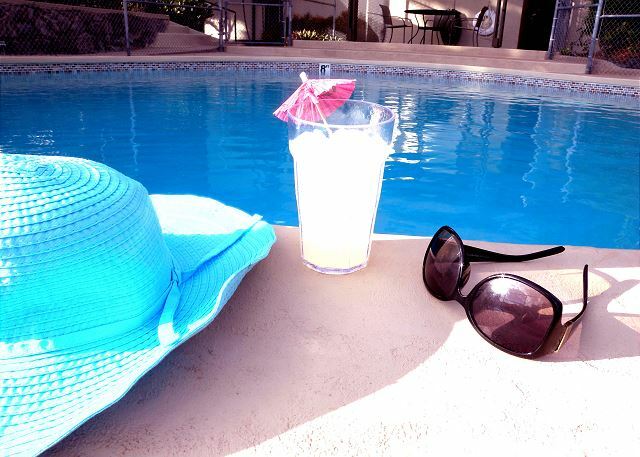 Mahalo nui loa, for posting this 5 star review of your experience at Kona Mansions! We are happy to hear you had an enjoyable stay at this fully equipped condo. We sincerely hope to see you again soon and take advantage of our coveted repeat visitor rates. The property was exactly as described. Very clean, well maintained. The view was perfect. Walking distance to all restaurants and to the water. I stayed here three months and didn't have to have anything. All cooking supplies bath towels. Perfect sunset views over the water. would recommend. Thank you for sharing you ohana. Thank you for posting this 5 star review of your experience at the property! I am happy to hear you enjoyed your stay at the condo. We sincerely hope to see you guys again soon. Simply remember that the best possible rates are found directly through Boundless Hawaii. Aloha! Thank you for your review. 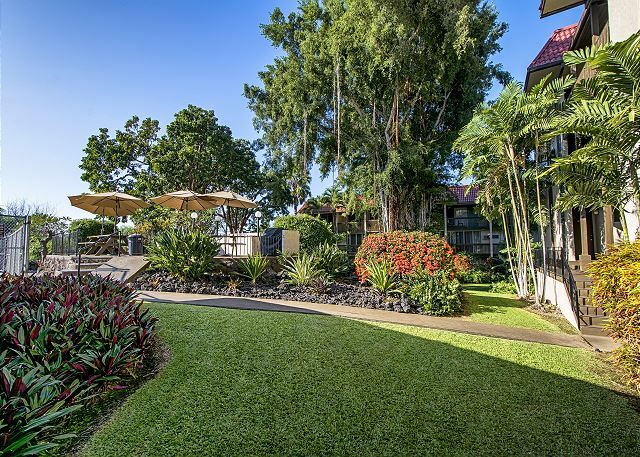 Please come visit again and we would be happy to offer a 10% returning guest discount for any reservations booked directly through Boundless Hawaii. 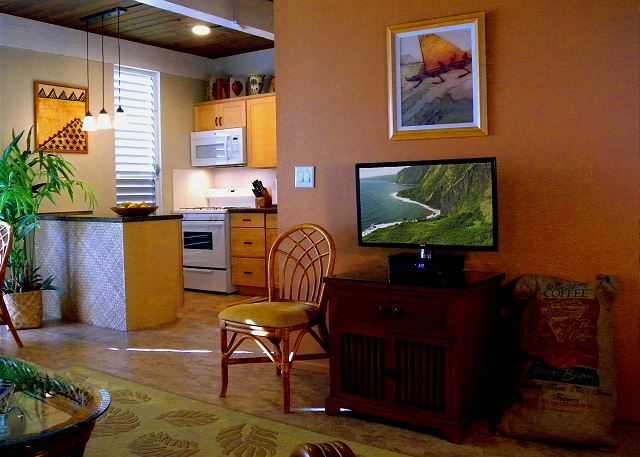 We liked the location, so close in to the action in Kailua Kona and the attractive condo. From here we were able to walk or drive to the beaches and other attractions. So many birds right outside our balcony! We needed service for three things while we were there and the service was prompt and excellent. We felt well cared for. The owners provided beach chairs, towels and mats which was greatly appreciated since these are hard to bring on a flight. And the kitchen was well stocked for cooking meals "from scratch". The only irritant was the leaf blower and traffic noise, which unfortunately goes with the otherwise great location. It was well equipped, very close to town, nicely decorated with a homey look and feel. Everything worked, great WiFi connection and a designated parking space. Great unit. Easy to get to and in great shape. Would stay here again. Easy walking distance to many restaurants/shops. Reservation was really easy and the app that the management company (Boundless Hawaii)sent was really easy to use. It was a great spot with great views across the water. Everything worked well - except for two things: 1) the afternoon winds can be very strong and can blow out the screens which if you open the shutters too far to let in more light. The screen tabs need to be fixed to make the screens more secure in high winds. 2) The sink has an obvious problem - probably associated with something way below being blocked rather than with this unit (A203). We got blowbacks in the sink which left a thick black residue at the bottom of sink. Other guests had said something about this in the guest book. The written instructions we got were to go to building 2 - but when we got there there was no building 2. The designated parking lot was in front of building A and this is where the unit was. The condo was clean and with a great location, close to beaches or shops. It has many beach items and a full kitchen.The beds were uncomfortable and we couldn't rest very well. For this reason I gave it 4 stars. Positive. VG for 2 supporters for IM. Fans and breezy airflow in humid weather kept it cooler. After first day could not get TV to work. Close to VG eating out areas, small servo, fresh grocery market, need car to reach major supermarkets. We also used facilities in well equipped condo. It lacked some basic cleaning materials. We stayed here for 8 nights in January and had an amazing time. The condo was clean, nice, and had great ammenties that help make visiting the Big Island perfect. Pros:1) Great location with easy access to downtown Kona and nearby highways. 2) Great ocean view and being on the second floor you get great breezes that keep the unit a very comfy temperature without the need for the a/c. 3) Well equipped kitchen and very roomy fridge and freezer. They even have an assortment of different spices. 4)Well equipped with extras like two snorkel gear sets, beach chairs, cooler, boogie boards, an umbrella, and plenty of towels both beach and condo. 5) Wahser and dryer were awesome to have inside the unit, leaving Hawaii with clean clothes! 6) The pictures on the website don't do this unit justice. 7) Great communication with Boundless Hawaii made it easy and pain free! Cons: 1) The location of the TV makes it a little hard to get comfy to watch it. If it were moved to the other side where the chair is, it would be much better, but it's not a deal breaker. 2) Having to leave Hawaii to go home. I would stay here again.